For this month's challenge I stuck to tradition. An apple pie. It felt appropriate for July 4th. This, along with some baseball and fireworks (beer too!) and I'm happy. I used two types of apples: Red Delicious and Braeburn. I gave Granny Smith a thought, but decided against the old gal. The crust, which I anticipated, was my real challenge. However, this time it was easier to roll and deal with. I have to remind myself to move a little faster though b/c it warms quickly and likes to stick to the counter. I tossed my apples with the dry ingredients and immediately the kitchen smelled of fall. it seemed fitting b/c although it's July, it was fairly cool for us NC folk. I rolled out the bottom portion of the dough and layed it in the pie dish, then filled it with the apple mixture. For the top, I attempted the lattice look. Again, I wasn't moving quick enough so the strands started to break on me. I don't have the easy cut out tool that Sandra Lee. My pie has the more rustic look like Grandma Walton would have baked. I was out of eggs so I brushed milk on the crust and gave it a slight sprinkle of sugar. Bake at 375 degrees for one hour and voila! 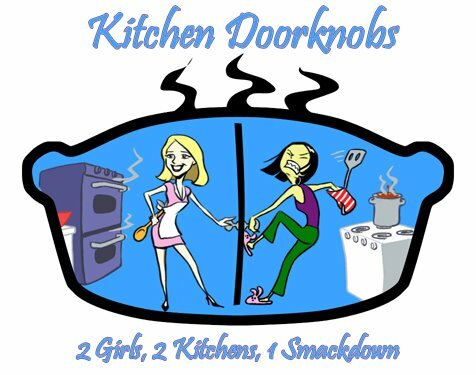 Until next time, fellow doorknobs, keep those ovens and buns HOT! Ok - so I was wrestling with a few different possibilities this month and my intentions were to make a pulled pork coleslaw pie, but I thought that was a bit over the top, so I decided on using fruits of the summer. 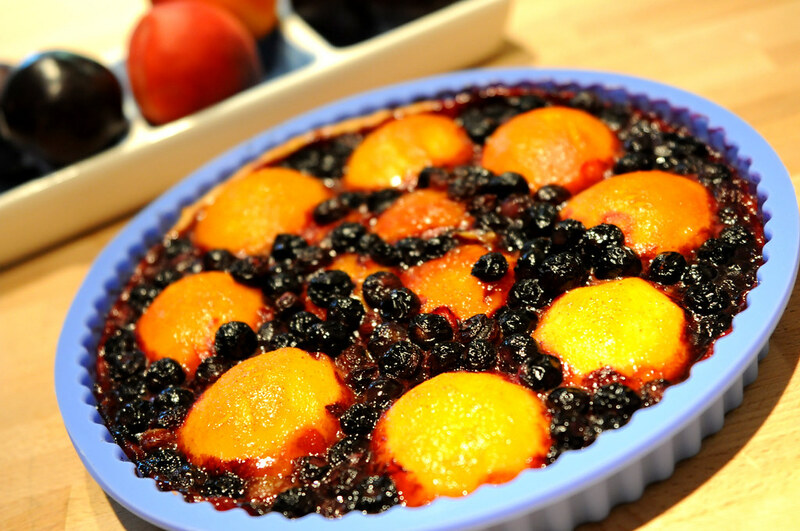 Blueberries and peaches are in season, why not make a tart out of it. And yes, I didn't make a pie, pies and tarts are essentially the same to me, except I'm not a huge fan of too much crust, a tart was the next logical choice. I've made apple tarts, pear tarts, even peach tarts in the past, except this time I decided to twist it up a bit in the prep of the peaches and blueberries instead of just throwing them into a crust and baking w/sugar. Combine flour, salt into a food processor, add in cold (cold!) butter until you get breadcrumb consistency. Add in cold water a bit at a time until the dough comes together, roll out on floured surface and gently lay into your tart pan. Trim off the edges. I opted to try out a new silicon tart pan this time instead of using a generic metal one. I like it a lot, non-stick! Bring a quart of water to boil and add in 1 tablespoon of the granulated sugar. Place peaches into the pot once it starts to boil and let simmer for 5-7 mins depending on how firm your peaches are. Remove and run under cold water immediately. Halve peaches to remove pit and the skins should come right off. Set aside on a plate. Preheat oven to 425. 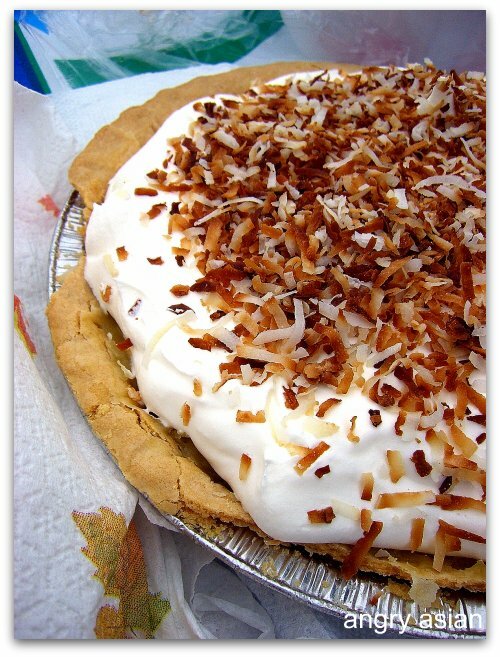 Take the other 1 tablespoon of granulated sugar, combine with 1/2 tablespoon cinnamon, ginger mix thoroughly, add to the bottom of your pie tart covering the bottom of the pan. In a sauce pan, add 1 tablespoon of water with 1 cup light brown sugar set to medium high until the brown sugar begins to dissolve and lightly bubble and add in 1/2 tablespoon remaining cinnamon. 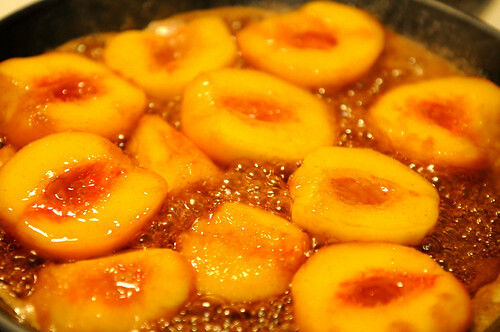 Once sugar begins to bubble, place halved peaches into the pan being careful not to splash hot sugar. Let simmer, flip cut site down occasionally for 5-8 mins, until peaches become tender. Remove the peaches from the syrup placing them cut side down into the dough. Add into the syrup the package of blueberries and let simmer for 2 mins. Turn off heat, and add blueberries into tart pan covering gaps. Drizzle some of the syrup onto the top of the tart before placing into oven. Bake for 20-25 mins. Remove from oven, let set for 30-40 mins. Serve warm plain or with a bit of vanilla ice cream! for this month's challenge i actually made a tart. but then i argued with myself that it wasn't really a pie. pies are deeper whereas tarts are more shallow. i also argued with myself over the timing. i wanted to make the crust from scratch but i just did not have the time to make it, (i did make the tart dough from scratch). there was a lot of arguing within myself this month. nuria tasted the filling, it was too sweet for her liking. for me, i didn't taste it, i don't like coconut. 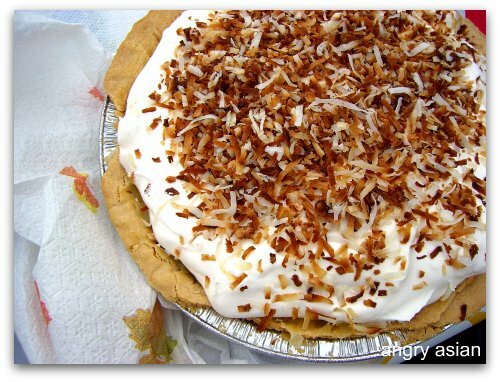 i think i will do this pie again, but in mini version, for jason. it's not often that i bake for him.